Some vegetables are tender and / or taste less bitter as they contain less or no chlorophyll. This can be achieved by covering them from light, so that they remain bleach, pale. 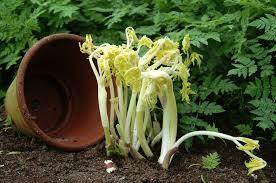 Very extreme this can be done by covering them with soil, for example, such as chicory and asparagus. Cabbage and lettuce are making heads so the inner remains paler and softer. In some cauliflower bracts are snapped over the flower, so that it stays nice and white. The green (er) parts of these plants are therefore just as edible, only sometimes tougher and with a stronger flavor. Seeds contain all the necessary materials and food reserves for the young plant. The seed itself is often dry and hard, so we grind them to get to the food stuff. We can also let the seeds germinate, whereby a large proportion of the nutrients enters the dash. And they are often soft and tasty. 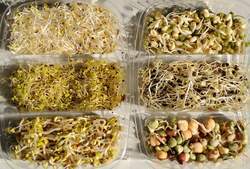 Of these 'sprouts' or 'sprout seeds' are soy sprouts and cress or watercress probably the best known. But also other seeds lend itself to this. Sunflower with a dash of up to 6 millimeters. Seeds with a longer spout taste bitter. The 8 cm long shoots of the little-known asparagus pea. During germination, starch is converted into sugars and amino acids are created. In order not to get too much pollution and soil bacteria it is usually sown on substrate. You can do this on towel, cotton wool, muslin... Keep the seed moist, but not wet. When drying the dash dies. In a wet environment will quickly arrive rot or mold. Cover the seeding (with a piece of cardboard) of light. Once the sprouts are a few centimeters long, we remove the cardboard and put the plants in the window so it colors pretty nice (green, red.. depending on the plant). When the shoots have the desired length (a few centimeters, also depending on the type), you can harvest or cut them. Also useful are broccoli, lentils, garlic, leeks, beetroot, red cabbage, onion, fennel, chickpeas, pumpkin, spelled, rye, rice, buckwheat, sweet corn, mustard, cress, daikonkers (sort of radish cherry (var. longipinnatus)), mat bean (Vigna angularis), horse bean, fenugreek, squash, alfalfa, rice bean, radish and bamboo shoots. You can use the crop as a garnish, on sandwiches, in salads and sauces, tortillas and pizzas, omelettes and stir-fried dishes and soups. Poire William, pear in a bottle (there are more spellings used) is an alcoholic beverage that seems especially because a peer is in the bottle. Eau - de- vie (French for water of life, in Danish Akvavit) is a collective name for many spirits, often created as a distillate of fermented fruit. Poire Williams comes from the Rhone Valley in the Swiss canton of Valais. There is eight kilograms of pears needed in order to make a bottle Poire. The bottle is pushed around the still small bulb on the tree. Bottom up, so they do not run full of water. She is growing in the bottle, as in a mini- greenhouse.